Podcast #19: Tomorrow Never Comes (1978) | Why Does It Exist? Behind the scenes peek: if there's a poster here instead of a hilarious picture, I probably forgot the DVD at Dan's. After a brief (yet predictable) MIA spell for Dan, Why Does It Exist? returns for a month-long foray into the exciting world of Canuxploitation and more specifically of tax-shelter films from 1978 to 1982. 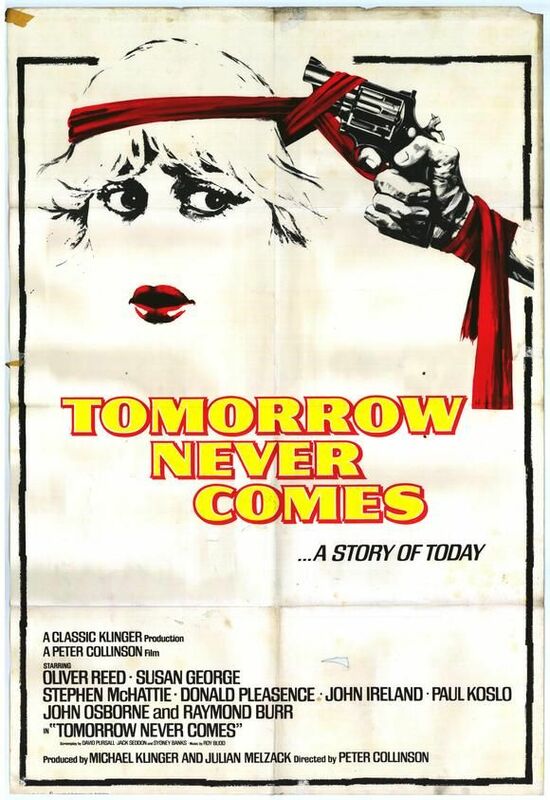 Capital Cost April begins in full swing with Tomorrow Never Comes, a Montreal-shot hostage thriller that essentially plays out like a low-wattage Dog Day Afternoon with 100% more cans of Molson Export. A whispery, roast-beefesque Oliver Reed leads negotiations with the unhinged Stephen McHattie as he holds his ex-girlfriend (Susan George of Straw Dogs infamy, wailing hysterically as always) hostage. Lots of character actors are trotted out to give exposition, everybody sweats a whole bunch and the rebellious spirit of 1978 Laval is stamped out in favour of non-descript suburban nonsense. Featured music this week are selections from Montreal supergroup Quatro’s newest EP, Les éclairs me donnent la vie. You can listen to and purchase it here.